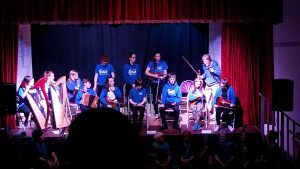 The night we were in Moville, there was a fundraising community performance, and our group was invited to share the stage. It opened with a group of young trad musicians, some the same age as our group, much like Young Traditions VT. They were amazing – harps and flutes, fiddles and concertinas. They were followed by a group singing lively sea shanties, including Jo, the woman from the organic food shop. Small town! Then a choir came on, a choir that sings songs that one sings in the shower, like ABBA and John Lennon. They sang brilliantly and the joy was infections. 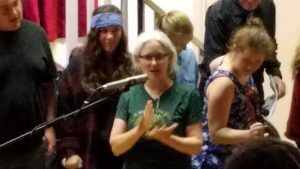 Our kids did a short set with a poem and some tunes, and they brought down the house.